I have three (3) Blue-Eyed Girl Lacquer from the Once More with Feeling Collection (OMWFC) to share with you - Tea is Soothing. I Wish to be Tense, I'm Going Through Some...Changes, & We Saved the World, I Say We Party! This is a restock of a collection that was released in 2013. Tea is Soothing. I Wish to be Tense is based off of Rubert Giles, the Watcher. A beautiful blue linear holo with an ice blue flash. I'm Going Through Some...Changes. is based off of Oz, the werewolf. A stunning brown linear holo with copper shimmer. We Saved the World, I Say We Party! is based off of Buffy Summers, the slayer. A pretty pale pink linear holo with a strong pink flash. All photos shown are with base coat, two (2) coats of polish for full coverage and topcoat. No issues with application or formula. 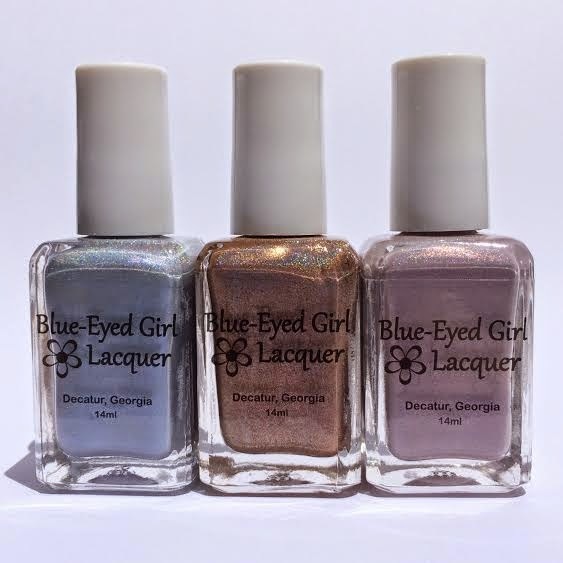 Blue-Eyed Girl Lacquers are designed to be opaque in one or two coats, so they may need to be thinned to your desired consistency. *Photos taken outdoors in direct sunlight unless otherwise stated. Once More with Feeling Collection is available now at Blue-Eyed Girl Lacquer shop! The full set is $96 (full size bottles) | $48 (mini bottles). For individual bottles: Full size bottles $12 | Mini bottles $6. Social Media: Facebook | Instagram | Twitter | Pinterest | Blog | Facebook Group (BEGLove): inquire at BEGLovefb@gmail.com to be added to the vouching list. 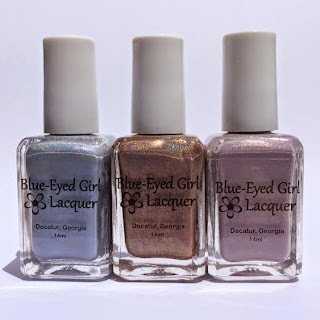 Disclosure: The polishes in this post were provided to me by Blue-Eyed Girl Lacquer in exchange for an honest review. All opinions are my own. Copyright © 2015 KimberlyK.com. Simple theme. Powered by Blogger.